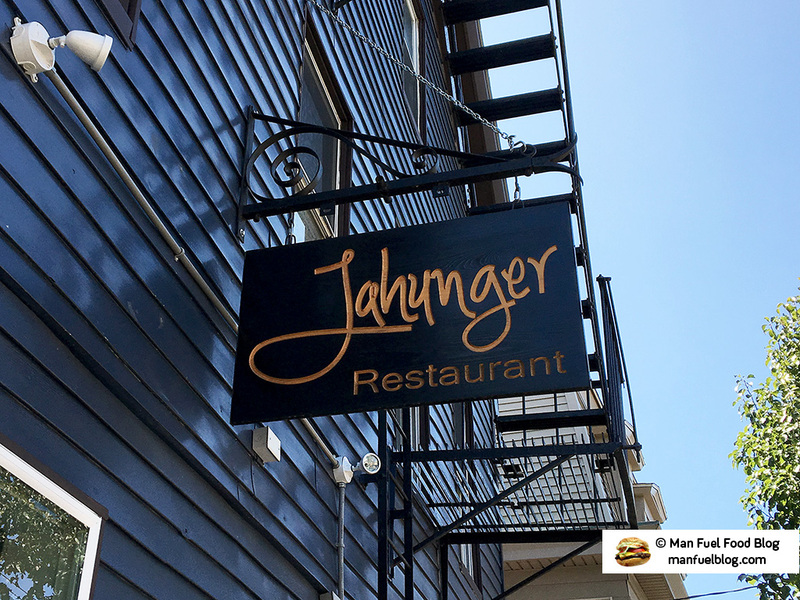 Jahunger was one of those restaurants that seemed to come out of nowhere and took the Fox Point area of Providence by storm. As soon as it opened the positive reviews came pouring in. 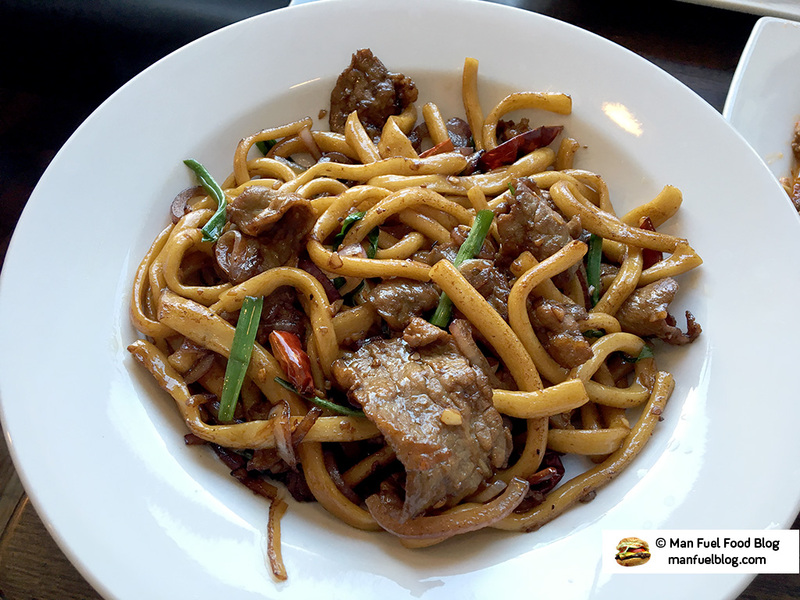 The descriptions indicated that Jahunger served mainly Chinese noodles, but as it turns out, the cuisine label doesn’t really do the restaurant justice. The restaurant serves Uyghur cuisine, which is similar to Szechuan and Central Asian food, but it does have it’s own unique spin. I was very eager to try the restaurant and luckily it lived up to its reputation. If it wasn’t for the stylish sign, one might dismiss the location of Jahunger as just another apartment building. It’s one of the many restaurants finding a new home in what looks like someone else’s old home. Upon entering, the service is friendly, welcoming, and they are willing to answer any questions about the menu as well as offer suggestions. The restaurant itself reveals what appears to be an odd combination of decor at first glance by an untrained eye like mine. There are Chinese or typical Asian-themed elements in the decor (the style of intricate designs), but there are also Middle Eastern elements as well (such as camels and some of the gold metal work). It turned out that while this observation of combined cultural decoration is somewhat accurate, it is actually representative of a culture and cuisine type many are not quite as familiar with in Rhode Island. Jahunger is categorized as “Chinese” food on many websites, but it seems like more than that because the food is reminiscent of countries in Central Asia like, Kazakhstan or Mongolia, which have been influenced over time by their bordering neighbor nations of Western China, Afghanistan, Pakistan, India, Turkey, Iraq, and Iran. The actual cuisine type is Uyghur, which comes from a blend of ethnic groups in China. As I said, Jahunger’s Uyghur cuisine seems to channel some Central Asian cuisine, but also with a heavy Szechuan influence. We enjoyed all of our food and drinks with the appetizers really impressing us thoroughly. Fruit Tea – Simply, wow. My wife wanted to order some of this tea and while I’m not a big tea drinker other than at restaurants, I found the description intriguing. The clear pot came out revealing the beautifully brewed tea that wasn’t too dark or too light. 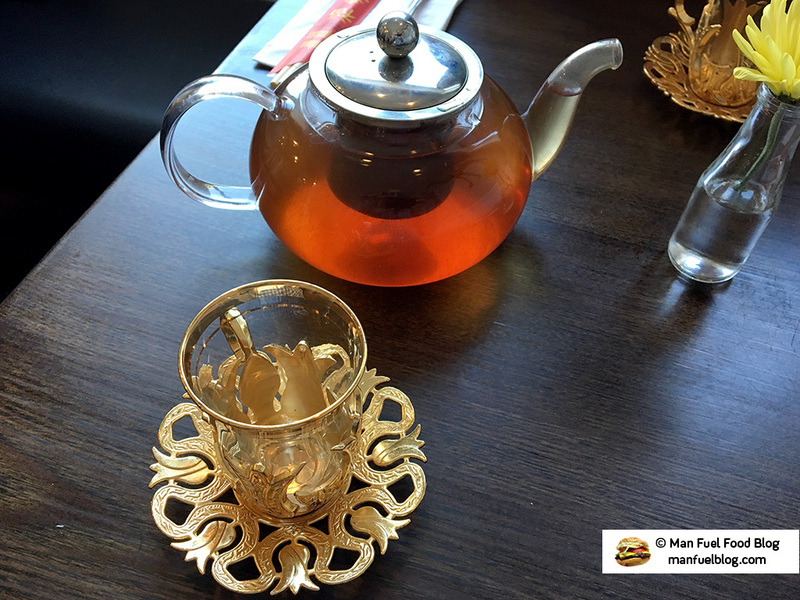 The cups that accompanied the tea looked wonderful as well with their decorative metal ensconcing the clear glass with gold patterns. The tea itself was just excellent. It tasted exactly as described – tea and fruit, lightly sweetened. Any visit I make to Jahunger will probably contain an order of this tea. Cold Beef with Cucumber – If there is one dish that won me over at Jahunger it would be the Cold Beef with Cucumber. The name may or may not sound all that appetizing, but this was easily my favorite dish of the whole meal. 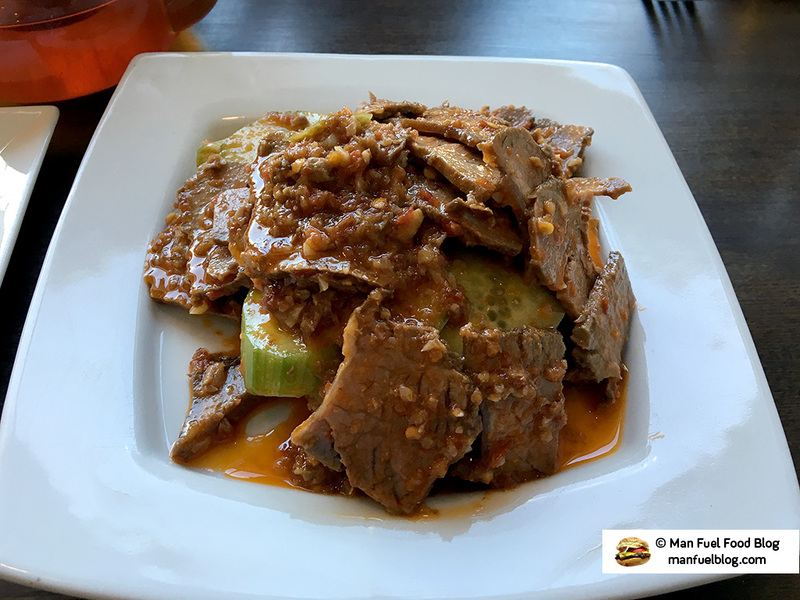 The tender beef and cool, crispy cucumbers were slathered in a spicy chili sauce. I personally didn’t find the spiciness overwhelming, but I enjoy spicy food and I could see the dish perhaps being a little too spicy for some. Nonetheless, the spicy heat and the cool ingredients worked magically together. I would come to Jahunger just for this dish. 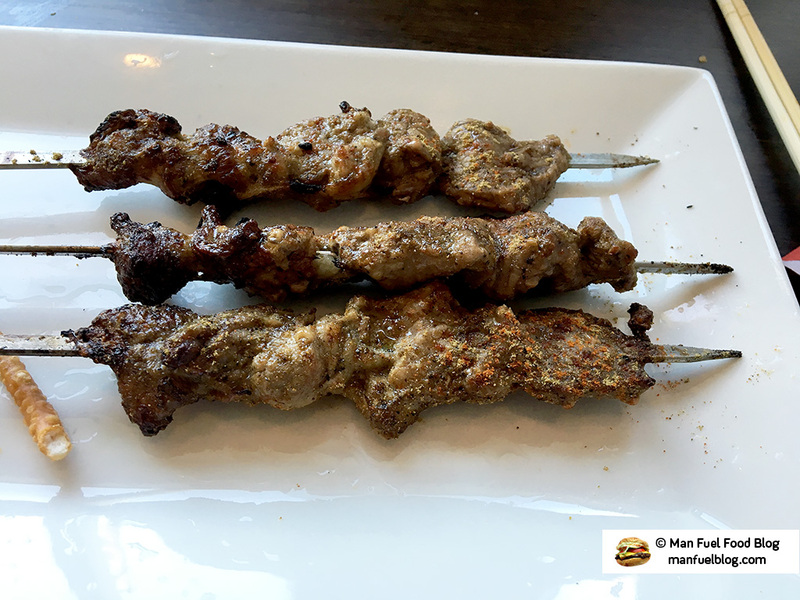 Kevap – Our server recommended the lamb skewers made using a secret family recipe. The skewers were indeed very nice. The crispy yet tender lamb alternated between some lean and fatty bits. The spices have some cumin in them, which always surprises me in Asian dishes because it’s not a flavor I think of when I think of Asian food, but rather one belonging to Middle Eastern food. Apparently, cumin is a somewhat common spice in some Chinese barbecue as I learned from other experiences and it works when done right. Chicken Stew – My wife ordered the chicken stew, which was good in theory, but not what we were expecting. The broad noodles were very long and al dente, which made them taste good coated in the flavors of the stew. The potatoes, vegetables, and chicken were cooked very nicely and all of the flavors combined very well in a somewhat spicy way with the chili peppers. The chicken was on the bone, which made the dish hard to eat as well. While bone-in chicken cut across the bone is typical of many Asian-style dishes and it can taste very good, it requires very careful eating so as to not accidentally bite down on bones. It would have been nice if the description in the menu indicated this. Lastly, the only significant hiccup I could see with the dish is that some of the spices like star anise were left scattered throughout the dish. These spices are very hard or sharp and we did not feel they could be eaten as they were, so we found ourselves spitting out broken pieces of star anise while we ate. With a little refinement, this dish could be excellent. Jahunger Noodles – When I see an item on a menu that carries the name of the restaurant, I am automatically intrigued. One would assume that the best dish on the menu would be the only one worthy of carrying the restaurant’s name, so that’s what I ordered. The Jahunger noodles were very good and spicy. 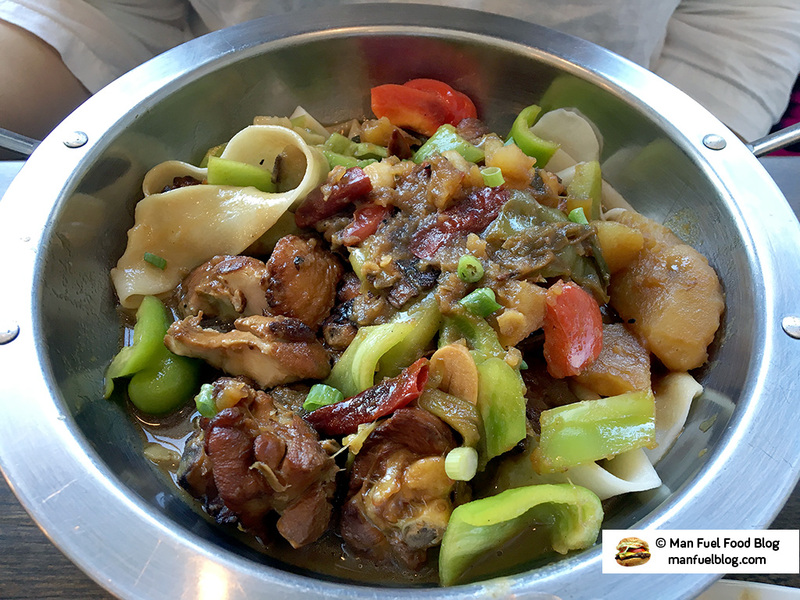 The tender beef rested on a bed of hand-pulled noodles, scallions, mixed with a “numbing” chili sauce that uses Szechuan peppercorns. I thought it was a nice, simple, dish showcasing Szechaun flavors that I love. I’ve had many Chinese and Asian noodles over the years and I think Jahunger tends to make them on the firm side. I enjoy al dente or chewy noodles for their texture and it may just be my preference, but I thought if the noodles were cooked just a bit more that the dish would really have shined, but I still definitely enjoyed it and would eat it again and again. 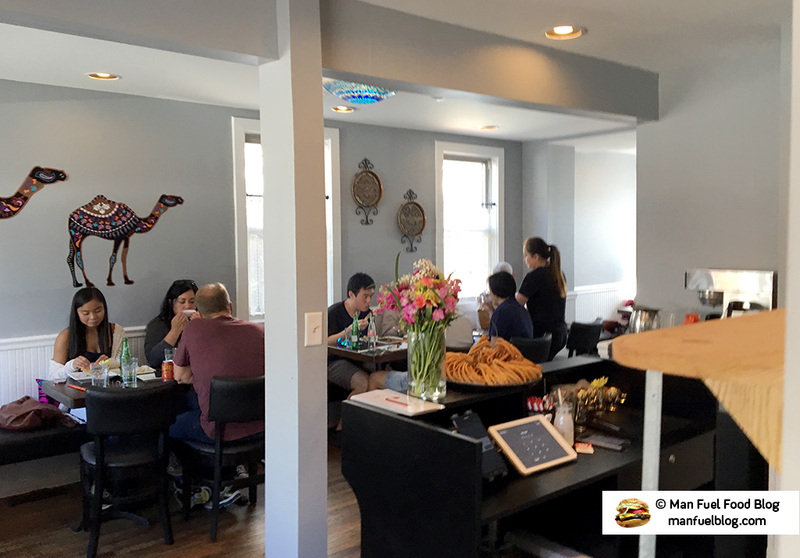 Jahunger is a great addition to Providence as a restaurant that serves Uyghur cuisine. The appetizers (especially the cold beef and cucumber) are where the restaurant really shines, but they also deliver with their hand-pulled noodle entrees. I’d recommend Jahunger to anyone, but especially to people that love spicy food or who are looking to eat Asian-style cuisine with a different flare than what most people are used to in Rhode Island.